Prime Minister David Cameron was forced on Wednesday to push back his plans for an imminent military strike against Syria in a humiliating climb-down for Britain’s leader after coming under fierce domestic and international pressure. Just a day after recalling Britain’s parliament to vote on how to respond to Syria’s suspected use of chemical weapons, Cameron was ambushed when the opposition Labour party said it wanted greater parliamentary scrutiny and rebel lawmakers in his own ruling Conservative party said they would oppose him. Earlier on Wednesday, U.N. Secretary General Ban Ki-moon had sought more time for inspectors to complete their work, Russia had said it was premature to table a U.N. resolution, and the Labour party had made it clear it wanted clear proof that the Syrian government had used chemical weapons. Cameron’s failure to execute his original plan of action could hamper efforts by the United States to deliver a swift cruise missile strike against Syria as early as this week, potentially harming London’s alliance with Washington. Inspired by the legacy of public mistrust left behind by former Prime Minister Tony Blair’s contested decision to go to war in Iraq in 2003, Labour leader Ed Miliband and some rebel Conservatives used the prospect of a government defeat in parliament to force Cameron to delay action. After hours of impromptu negotiations between Cameron’s political managers and the opposition, his office agreed that the United Nations Security Council should see findings from chemical weapons inspectors before it responded militarily. “The United Nations Security Council must have the opportunity immediately to consider that briefing (from inspectors) and … every effort should be made to secure a Security Council Resolution backing military action before any such action is taken,” a British government motion to be debated in parliament on Thursday said. 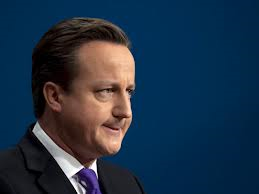 Britain had previously declined to say it would wait for a U.N. report before launching military action. But on Wednesday it promised parliament would be given a second vote before Britain committed to direct military action, rather than the single vote – on Thursday – it had initially promised. “A watered-down motion is better than a defeat for the government,” said Andrew Bridgen, a Conservative lawmaker who opposed immediate military action, told the BBC. “The motion … will not allow military action. We need hard evidence” to sanction military action. Cameron had said earlier that Britain would put a draft resolution to the U.N. Security Council condemning the suspected chemical weapons attacks by Syrian President Bashar al-Assad and authorizing “necessary measures”. Britain’s National Security Council had also unanimously backed action. An amendment to the government’s parliamentary motion tabled by the Labour Party said it would support military action only if members of the U.N. Security Council saw the inspectors’ report first, among other conditions. British Foreign Secretary William Hague had earlier said Britain’s national security would be undermined if it failed to challenge the Syrian government over the use of chemical weapons against its own people. Hague said it was the first time that chemical warfare has been used anywhere in the world in the 21st century, saying that efforts to bring Syria to book through the United Nations had failed. “We cannot allow diplomatic paralysis to be a shield for the perpetrators of these crimes,” he wrote. But by Wednesday evening his tone had changed. “The motion that we’re putting forward tomorrow reflects the Prime Minister’s recognition of the deep concerns in this country about what happened over Iraq,” he said in a statement. Lawmakers will still debate Britain’s response to the chemical attack in Syria on Thursday after Cameron cut short his holiday, recalled parliament, and rushed back to London to chair a meeting of the National Security Council. Public support for action is fragile. A YouGov poll published showed 50 percent of the British public opposed a missile strike on Syria, with just 25 percent in favor of it.